Become A Life Coach helps you to fully understand and appreciate what Life Coaching is all about. Empowering yourself and your clients to produce extraordinary results in their personal and professional lives. Life Coaching is one of the most rewarding careers but it takes time, experience and that 'someone' special to truly do it justice! "The Book Of Wealth" by Hubert Bancroft was recommended to me when I was training to become a Life Coach. However, due to the limited number of copies printed and also the price, this was something that was beyond my personal means at the time. 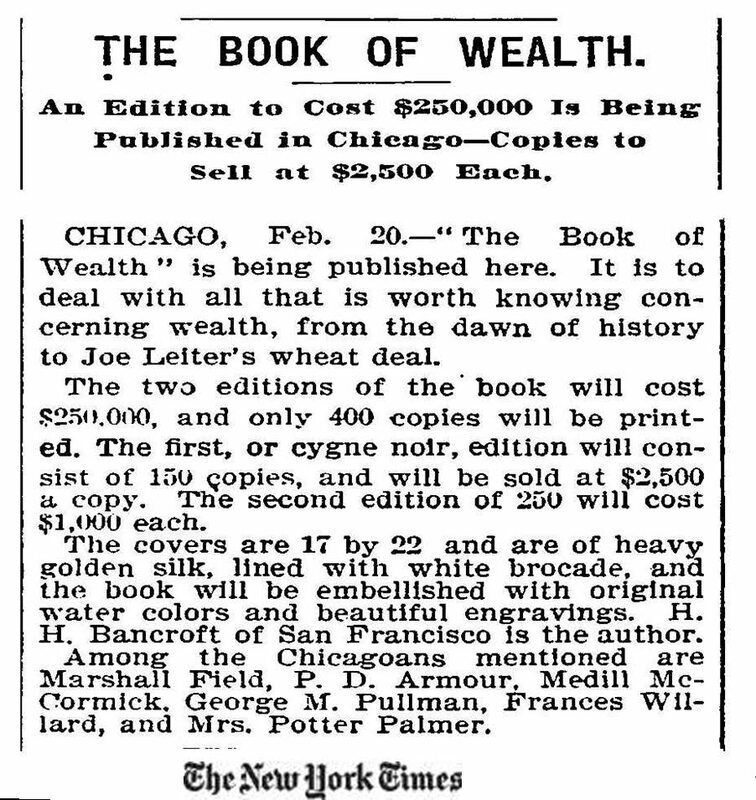 Now, however, the entire 10 Volumes of "The Book Of Wealth" has been scanned and is now available to download as an eBook...well actually, 10 eBooks!! 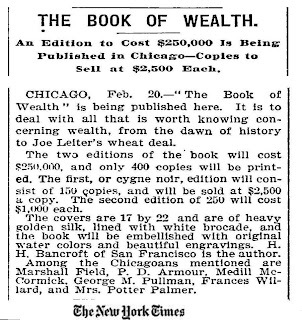 I won't cover the detail in depth on this post as you can read more about the book and the author, Hubert Howe Bancroft at Book Of Wealth. I should probably add that this is not easy reading as it is an historical analysis of wealth creation. However, if you check out the above site you will see a video by Dr John Demartini as he, and other motivational speakers often make reference to it. It is said that good time management can add two hours to a person’s daily life (Tracy, 2007; Panella, 2002). Those hours can mean the difference between having quality of life and feeling strained; more time spent with loved ones including playing with children and helping them with their homework; having time for a hobby such as creating a fabulous garden; extending their education or they could simply relax! Teaching time management to clients is not just about focusing on matters of organisation or looking at how to squeeze the maximum amount out of each hour of the day. It is also about investigating the psychological and emotional factors in addition to the usual organisational issues. Aspects of why the client is not using their time more efficiently or why they have issues with time can be addressed. Coaches can also work with clients to discover why a client is inefficient with their time and their sense of their time not being well spent. Time management is also something that dovetails well with other forms of coaching. Someone who is stressed and who needs to find more time to relax will benefit from assistance with time management. Couples who need to spend more time with each other, students under pressure as they approach exams and, of course, busy managers, executives and parents are all likely to benefit from help with time management counselling and coaching. The 80/20 rule: The 80/20 principle is also known as the Pareto principle. It is based on the ideas of an Italian economist called Vilfredo Pareto. Pareto was a French-Italian economist and philosopher who lived between 1848 and 1923. Initially his observations were based largely on the distribution of wealth. In other words, he saw that 20 per cent of people owned 80 per cent of wealth. The remaining 80 per cent control only 20 per cent of the wealth. Over time it was realized that the same principle could be applied to many areas. In time management this can be applied in a number of ways. One of these is to say that 20 per cent of what you do accounts for 80 per cent of your results (Koch, 1997). Prime time: In line with the 80/20 rule is the idea of ‘Prime Time’. It is found that not only do 20 per cent of your efforts account for 80 per cent of your results, but also that your best efforts occur in 20 per cent of the day. In other words, most people are found to be somewhat inefficient for 80 per cent of their time. If someone is found to have a time in the day that is more productive than other times, this is when they should carry out their priority work and this is the time of the day they should protect themselves against distractions and diversions. Don’t try to change everything at once: Also following on from the 80/20 principle, it is best to help a client to focus on certain areas of their life, and set tasks that gradually help them to build from one success to another. For example, if a client is simply not sleeping well and their average day is a disaster due to exhaustion, then we know that a very large result can be obtained by working on this one ! problem. Similarly, if we go to a client’s workplace and observe them spending 5 out of every 15 minutes looking for something, then we know that helping them to reorganize their work area will give them an immediately significant result. From each success we can go on to the next area, rather than adding to their overload by trying to do too much at once. New habits take time to form: It can take 21 days to learn a new habit (Tracy, 2007). Therefore clients may need coaching, may need to do homework exercises and may need to repeat basics many times before they will really get a grasp on what they need to do. Tasks take up available time: When clients are attempting tasks they should keep in mind an old truth about time keeping; that a task will tend to fill the time allowed for it. We have all experienced this. If we think that we will stay up all night if necessary to get something done, often that will be the case. If we think that a chore will be done some time on the weekend, often we are racing to finish it on Sunday night. This is important when setting goals and deadlines. If people give themselves limitations on the time they are willing to allocate to tasks, they can quickly become more efficient. What are we going to stop doing? Time is a limited commodity. Management of time is partly looking at what can be done better or more efficiently, but it is of course also going to consist of finding things that should not be done or that no longer need to be done. Work efficiency and family time: Tracy (2007) makes the important point that what people require of their business and work time is efficiency, whereas family and personal life tends to come down to quantity of time. Taking a broader look at the problem: If a client wants to manage their time more efficiently, a coach needs to be able to look at the client’s life from a broad perspective to see what may really be going on. Coaches might detect some discontentment with life; hidden standards about what people think their life should be or underlying repressed emotions that are making them want to squeeze more out of every moment. Koch, R. (1997). The 80/20 principle. London, England: Nicholas Brearley. There are many mentors out there but few good ones. A good mentor has many distinct qualities. One needs to become familiar with them while searching for a mentor in order to be able to recognize a good one. What's the Hype About Coaching? You may have heard about Life Coaches and Business Coaches but they are for other people aren't they? Find out what your own personal coach can do for you! If you are really serious about learning how to earn passive and residual income online or offline then you really need to think about how you are going to make that happen. Often when we're starting out in this world of business and opportunities we really have no direction and feel confused. Ebenezer Scrooge Had a Life Coach? I would like to talk a little about your dreams, the big dreams, the dreams you had when you were 15 years old, 18 years old, or 20 years old. Do you know what I see? I see people give up on their dreams, the big dreams, and it seems the older we get, the more we give up on our dreams. 5 Key Things to Having Fashion Sense and Transforming Your Wardrobe For the New Year! Their are key 5 key pieces that can make a wardrobe and pull it together. At times it can be a dress or a blazer. However, you should always have key pieces that can take an outfit form drab to fab. What is your fashion resume? Do you have a signature style? Is it classic?, flirty?, relaxed? or artsy? Always keep in mind you look through your closet and do some spring cleaning. Figure out what you want, what you don't want and start making a list of pieces that are key to make it easier for you to pull an outfit together. With stock market values battered and the economic outlook grim, older investors can draw on a number of different strategies to keep their nest eggs from being wiped out. Boomers going from peak earning years to retirement should consider creating a withdrawal plan. As you begin to rely on your investments to meet living expenses, remember that your biggest enemy may be inflation--losing purchasing power. You can dial back the risk and adjust your portfolio to generate more income. Reduce exposure to small and microcap stocks and such volatile areas as emerging markets. But don't shift predominantly to fixed income if that means cashing out of stocks that could recover over the next few years. Retirees often make the mistake of raiding their tax-deferred retirement accounts first. That generates higher taxes that can kick off a vicious cycle: Paying those taxes further erodes the value of a portfolio. Bottom line: Most affluent investors should wait to withdraw from traditional IRAs and other retirement accounts until the government requires it--after they reach the age of 70.5 years old. And because it is the most valuable of retirement gems--for retirees and for their heirs, who will not have to pay taxes on the money--leave raiding any Roth IRA for last, if at all. The market's wreckage has created an opening for retirees to convert a traditional IRA to a Roth IRA, which switches a portfolio from tax-deferred savings to tax-free savings. When you convert, you pay taxes based on your tax bracket. With retirement account values down, it's a good time to make the move. Individuals or couples whose adjusted gross income does not exceed $100,000 can do a Roth conversion. After they do that, future withdrawals are tax-free--and there's no need to bother with those vexing required mimimum distributions. Investment advisers prefer total-return portfolios designed for growth--portfolios of stocks and bonds that provide income but that also offer the opportunity for capital appreciation on stock holdings over time. A retiree skims off the dividends and interest, as well as capital gains, and repeats the exercise each year. Obeying those marching orders, however, can be nerve-wracking. For one thing, steadily selling stocks to reap those gains requires a lot of discipline. Maintaining a two-year cash reserve in a total-return portfolion can help give retirees the courage to keep a respectable amount of their portfolio in stocks. And since many financial advisers have, over the years, been raising the recommended amount that older investors should hold in stocks, that staying power is crucial. The past several months have been filled with huge upheavals in the world. The stock market and resulting economic impacts on savings accounts and jobs, talks of recession and depression, the rash of terrorism in the East with headlines about what may be in store for the future. Yet other headlines herald political change at the national level that offers new hope. You are struck by a brilliant flash of intuition (an innovative book idea, creative business venture, fabulous investment...) and you think, "Yes! Eureka this is it!" But this "next big thing" excitement is shortly followed by a hesitation, as previous intuitive hits begin to re-surface... The ones that in the light of the next day you asked, "What was I thinking?" The ones that did the slow fizzle to oblivion. And the ones that never got off the ground. So is this just the caffeine buzz from this morning's latte or is this an actual divine inspiration? Being a mentor is an extremely responsible role to take on, but it can also be very rewarding. It provides a way to put your own knowledge and experience to good use in helping other people to make improvements in their own lives; personal or professional. Mentoring has been a very popular role in society in general and is a form of leadership that is certainly beneficial within business circles. One of the most important items to remember is that a mentor does not have to be a senior member of staff helping a more junior member. While employees aren't likely to mentor senior staff members it is true that people on the same level as each other can be of assistance in this way if both parties are agreeable. Leonard Cohen is credited with the above statement. I believe that he has captured the essence of beauty. Beauty is in the nature of our flaws. It is in our reflective self-awareness and acceptance of our imperfections that we discover our true beauty. It is said that we are pretty much formed very early in our lives by our "first family" experiences. The way we are socialized; that is simply, how we are taught to see and behave in the world by our parents in relationship to them, our siblings and the community in general, plays the most significant role in our formation leading into adulthood. Yes, we have to acknowledge genetics to some extent playing a role here, so I will do that. But this is not an argument about one or the other. I want to write here about dealing with our pasts. Remember this great old rhyme? For the want of a nail the shoe was lost. For the want of a shoe the horse was lost. Are you working for someone else's dream when you have one of your own? For years I did and didn't like it. In fact it made me crazy sometimes, I even thought myself a coward for not acting! You climb out of bed every morning; take a shower, brush your teeth, get dressed, have some coffee, toast or cereal, pat the dog, hug the kids, kiss the wife (husband), not necessarily in that order and head out the door to where and to what? No it is not a destination that I am talking about, it is a PURPOSE. Does your life have one? As some know and I do not often talk about it, I have had my own share of challenges over the last several years. In the fall of 2001, after being diagnosed with a lung infection that doctors were not able to eradicate with antibiotics because of an underlying chronic condition, I spent the better part of the next two years, my health slowly deteriorating as I gradually lost lung function. I was told early on that my only hope was a double lung transplant and without it, I would die! In Scott Peck's remarkable book; "The Road Less Traveled," first published in 1978, he opens with the now famous line; "Life is difficult." He then goes on to say; "this is a great truth because once we truly see this truth, we transcend it. Once we truly know that life is difficult --- once we truly understand and accept it --- then life is no longer difficult. Because once it is accepted, the fact that life is difficult no longer matters." I am sure that all of you who work in a corporate environment are familiar with your corporate mission statement? It is the one that typically hangs in the front reception area or perhaps on the wall in the boardroom. But do you have a personal mission statement and/or understand in a meaningful way what your purpose for living actually is?